Among the special guests at June in Buffalo this year is Swedish performer Magnus Andersson. 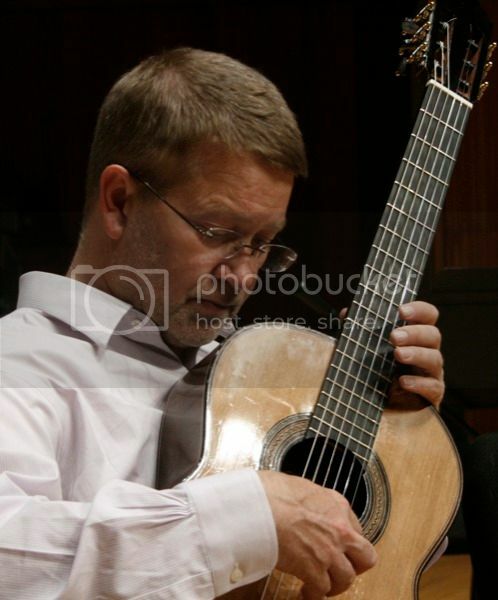 Andersson is one of the most renowned guitarists in the contemporary music field, and has played an important role in the creation of the instrument's modern repertoire. Andersson studied at London's Trinity College of Music and later at the Viotti Music Academy in Vercelli, Italy. He was awarded the Composers Union Interpreter Prize in 1983, received the Swedish Gramophone Prize in 1985 and 1986, and was nominated for a Swedish Grammy in 1992. In 1984 he was awarded the Kranischsteiner Prize at the International Summer Courses for New Music in Darmstadt. That same year he founded Darmstadt's guitar class, which he taught until 1996. He currently teaches at the Royal College of Music in Stockholm, and was artistic director of the Stockholm New Music Festival in 2006 and 2008. Andersson is a founding member of the chamber music group Ensemble SON, and has toured widely in a trio with cellist Rohan de Saram and bassoonist Pascal Gallois. He has performed the premieres of numerous important contemporary works including Ferneyhough's Kurze Schatten II (1989), Franco Donatoni's Ase (Algo II), James Dillon's Shrouded Mirrors (1987), Sven-David Sandström's Away From (1982), and Mark Applebaum's DNA, as well as guitar concertos by Pisati, Sandström, and Donatoni. The second movement, "Bridges in the middle of the ocean," begins with the solo guitar playing quick, ephemeral gestures and fragments of indistinct melodies as it journeys through a mostly silent space. Mere vestiges of the instrument’s typical sonority characterize its strange, veiled sound world: high residual pitches produced when the string strikes the fret, each accompanied by the woody thud of the finger hitting the fretboard. Finally, Andersson will join Dal Niente for a performance of Hans Abrahamsen's Winternacht, an earlier piece in that composer's oeuvre which Poul Ruders has described as "very precise and dreamingly poetic [...] almost classical in terms of clarity and discipline in orchestration and form." Such a description seems an apt representation of Andersson's own approach to his instrument, which is always marked by a firm technical precision that does not eschew the 'dreamy' or impressionistic. Indeed, this is why composers as varied as Ferneyhough, Scodanibbio, and Applebaum are continually drawn to write for him, and what makes him well-equipped to perform the music of Levine and Abrahamsen. We'll look forward to his performances this week!